Reading time: about 10 minutes. 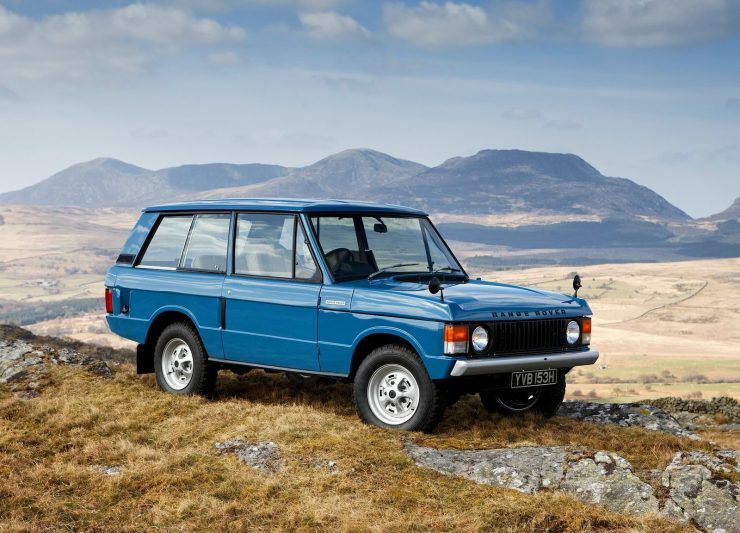 When it was first introduced in 1970 the Range Rover immediately caught the motoring public’s attention because it represented the addition of something that had been largely missing from the world of 4×4 vehicles – luxury. With the Range Rover the British nailed the concept of the comfortable 4×4, and created a vehicle that was (and still is) ideal for people who want to go places without leaving civilisation behind. The Range Rover is a car that could wind around the streets of London or New York, drive from Paris to Dakar or even keep right on going to Cape Town, and even do the Gunbarrel Highway across the centre of Australia. And remarkably the Range Rover managed to become a classic car style icon along with the E-Type Jaguar and the Mini. 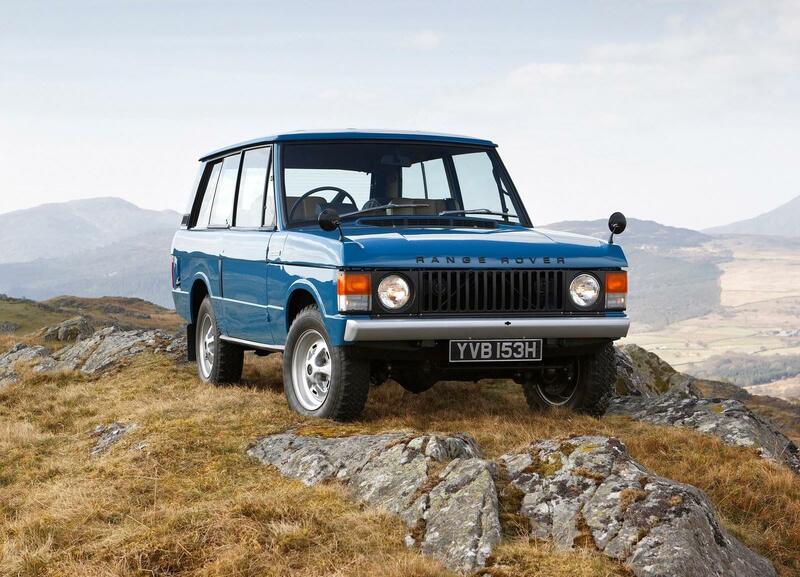 The idea of the Range Rover occurred to the thinkers and planners at Rover long before it was allowed to be created. Even the success of the Land Rover had come as a surprise to the management at Rover who had only expected the model to be produced for the few short years of post World War II austerity when both Britain and Europe were re-building. But when the humble Land Rover began to outsell Rovers conventional passenger cars thought was given to how to combine the comfort of a Rover road car with the off-road capabilities of the Land Rover. The first effort at creating a more comfortable Land Rover was the Land Rover Tickford wagon which had decent seats along with a heater and demister but it was only a first step in the right direction. Ten years after the Land Rover first made its appearance work was begun on creating a saloon car with four wheel drive off-road and on-road capabilities. That series of prototypes were the Road Rover and they were essentially a station wagon (estate car) body mounted on a Land Rover chassis with Land Rover suspension and mechanicals. The thinking was to create a car suitable for travel in Africa and Australia where country roads frequently became off road tracks. As an example the main east to west highway across Australia’s Nullabor Plain was not fully surfaced with bitumen until 1994. The Road Rover was not developed into a production model however and it was to take a measure of external pressure to get Rover thinking seriously about a vehicle that would blend the Rover car’s practical luxury with the Land Rover’s practical off road abilities. The catalyst was provided by the creation of three American cars; the International Harvester Scout, the Jeep Wagoneer, and the Ford Bronco. The final impetus was provided by the president of Rover’s US operations who fitted a Buick V8 into an 88” wheelbase Series II Land Rover and sent it across the pond to the boys at Solihull in England as an idea starter. It succeeded in getting people thinking and showed a way to achieve the desired result. In 1967 under the headship of Charles Spencer King who had been apprenticed with Rolls-Royce and had worked on Rover’s JET1 and T3 gas turbine experimental cars, work began on the new car. Working with Gordon Bashford the plan was to build a car that was of intermediate size between the Land Rover short wheelbase 88” and the long wheelbase 110”, so the wheelbase of the new car was set at 100” (99.9” to be exact). The engine of the new vehicle was to be the all alloy Buick V8 that had demonstrated itself to be so excellent in the Series II that the President of Rover USA had helpfully sent over. In choosing the V8 it was realised that the Land Rover differentials would not be up to the task of handling the power and torque of the V8 without risk of axle breakage so it was decided that the vehicle would be best created with full time four wheel drive to spread the load and to ensure impeccable handling on all road and off road surfaces at all times. That decision also ensured that heavy axles would not need to be used so as to keep unsprung weight down. Spencer King also decided that coil spring suspension would be essential to ensuring the best on-road and off-road handling because coil springs would enable much greater suspension travel. The V8 engine was tuned to optimise torque rather than power. Creating the bodywork presented some dilemmas. 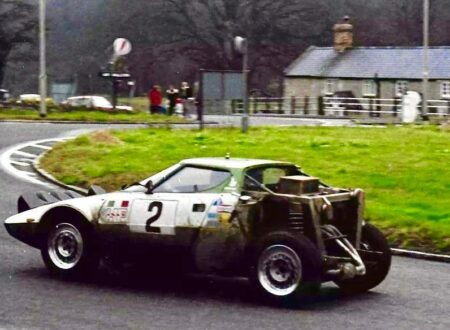 The body had to be strong enough to cope with mile after mile of potholes and corrugations but the car was going to be a four wheel drive which required high ground clearance so the centre of gravity of the car was necessarily going to be higher than might be desired. Gordon Bashford created the box section chassis and the long travel coil spring suspension. The upper body of the car was to have a steel frame with aluminium alloy “Birmabright” outer skin panels to try to provide the best compromise between durability and centre of gravity. The initial bodywork was created by the engineering team with minimal attention paid to styling but their efforts were simply so good that when the styling team headed by David Bache looked at it there wasn’t a lot they needed to do. By 1968 testing was undertaken world wide and on 17th June 1970 the car was unveiled to the press and then made its debut at the London Earls Court Motor Show in October of that year. At that time it was the only V8-powered full time four wheel drive production automobile in the world. 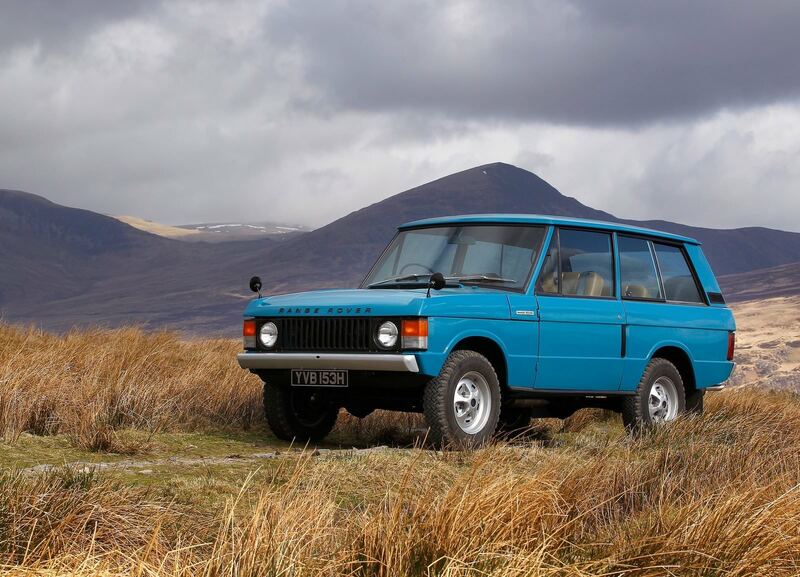 The Range Rover was to remain largely unchanged for the next nine years until Land Rover Limited were finally able to break away from the trouble-prone British Leyland Corporation in 1979. Only then were improvements and new models created. The first of the Range Rovers were made as a two door only up until 1981 when the four door was added. The two door continued in production until 1990. Engine: 3.5-litre (3,528cc) all alloy V8 with twin Zenith/Stromberg carburettors producing power of 130bhp @ 5000rpm and torque of 185lb ft @ 2500rpm. Transmission: Manual LT95 combined four-speed manual gearbox and transfer box with constant four wheel drive and manual differential locks. Fairy overdrive option available from 1977. In 1982 Chrysler Torque Flite three speed automatic available as an option. 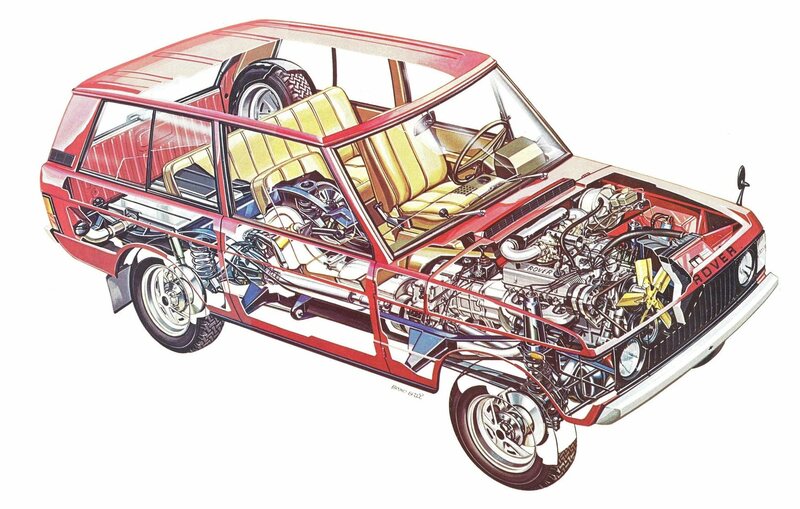 In 1983 the manual gearbox was upgraded to an LT77 five-speed gearbox with a separate LT230 transfer box. The LT230 transfer box was later upgraded to a Borg Warner chain-driven transfer box incorporating automatic viscous coupling limited slip differentials. Chassis, Frame and Body: Box section steel chassis with steel body frame and aluminium alloy “Birmabright” body panels bolted to the steel frame. 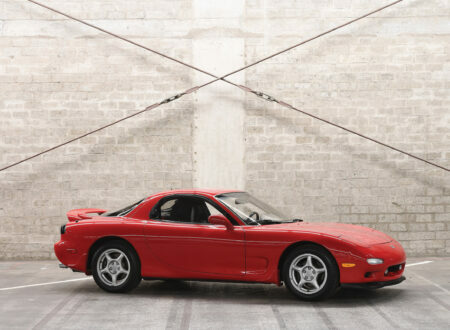 From 1987 onwards the body panels were welded to the frame to improve the fit of the panels and doors specifically for the US market. Suspension: Live axles with coil springs. Brakes: Power assisted discs all around. In 1990 the Range Rover CSK two door special edition was created as a tribute to Charles Spencer King. 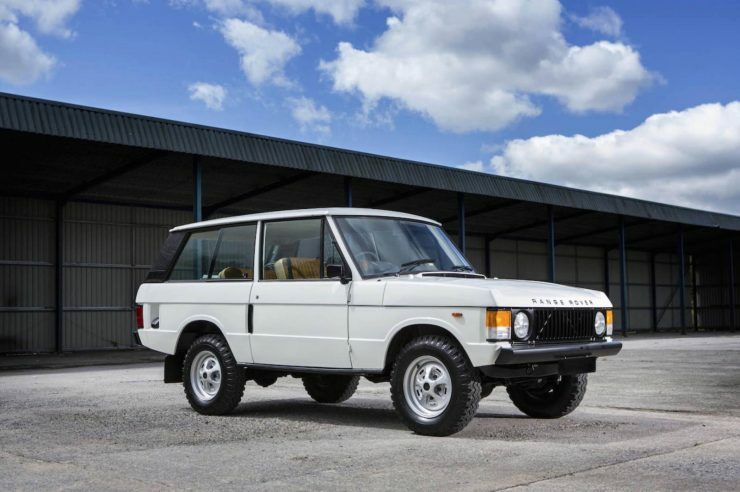 This model was fitted with the larger capacity 3.9 litre V8 engine and was capable of 114mph making it the fastest Range Rover Classic to be made. – The Range Rover is somewhat complex in its construction and it is strongly recommended that a buyer have a potential purchase checked by a Range Rover specialist. – Check the engine and chassis numbers carefully. 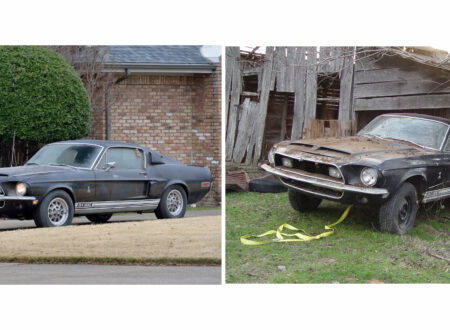 Engine swaps to larger and more modern versions of the Rover V8 were common, but vehicles with their original engines are worth a lot more on the investment market. – Check chassis and underbody for rust and damage. The Range Rover is an off road vehicle and may have been subject to chassis damage such as rock dents and deformation. 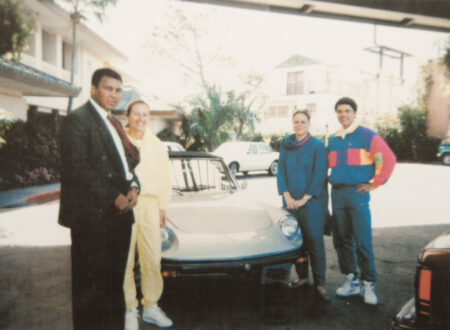 The vehicle may also have been used for beach excursions for surfing and fishing etc. and may not have had the salt deposits on it cleaned off soon after that exposure. Have a good look around and above the rear axle. – Check for signs of accident damage. Look carefully at body lines, fit of doors and door gaps, and how they close and open. – Check all electrical systems including A/C (if fitted), all lights, and all gauges. Although the car may look good on the outside and may even look good on the inside also it is important to lift up carpets and check underneath for signs of rust. Use a torch/flashlight and pay special attention to the front bulkhead, inner wheel arches and rear floor. – Check the top and bottom edges of the rear split tailgate for rust. Also check A and B posts. Remember that corrosion often starts from inside and works its way out so look for any tell tale bubbling of paint. – Check the interior trim including the headlining which can have a tendency to sag. – Check radiator coolant especially looking for milky deposits that indicate oil leaking into the coolant. – Signs of coolant leakage. – Engine running smoothly, listen for noise from the top of the engine after starting. The engine’s top end should quieten down soon after starting and stay quiet. If the car has had an LPG conversion check it has been certified and assess the quality of the work. – Drive the car and listen for tell tale noises such as the knocks and clunks of transmission wear. Use the car in an off road situation and engage low range and make sure it works well and stays in range, and stays in each gear especially in deceleration. Check the vacuum operated differential lock function is working correctly (if fitted). Drive line backlash is more common on the pre-1986 Range Rovers. The earlier models prior to the fitting of the Borg Warner chain-driven transfer box tended to suffer from uneven distribution of torque to the axles which can result in axle breakage. The Borg Warner chain-driven transfer box provided a more even distribution of torque to eliminate that issue. 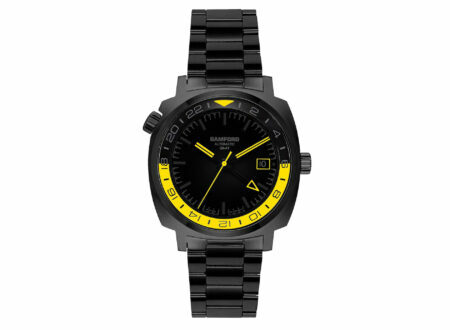 – The five speed gearbox model prior to 1989 is prone to problems with the fifth gear. To check first wind up the car’s windows to eliminate distracting noises. Then put the transfer into neutral and shift through each gear, if the whine of the gears becomes a growl in fifth it means a gearbox overhaul will be needed. The 1989 and later five speed gearbox is not prone to this problem. – Pulling under brakes typically indicates a failed hub seal. A spongy brake pedal may indicate master cylinder trouble or impending failure. – The power steering system is known for leaking as it gets worn. Leaking will mean a system overhaul. 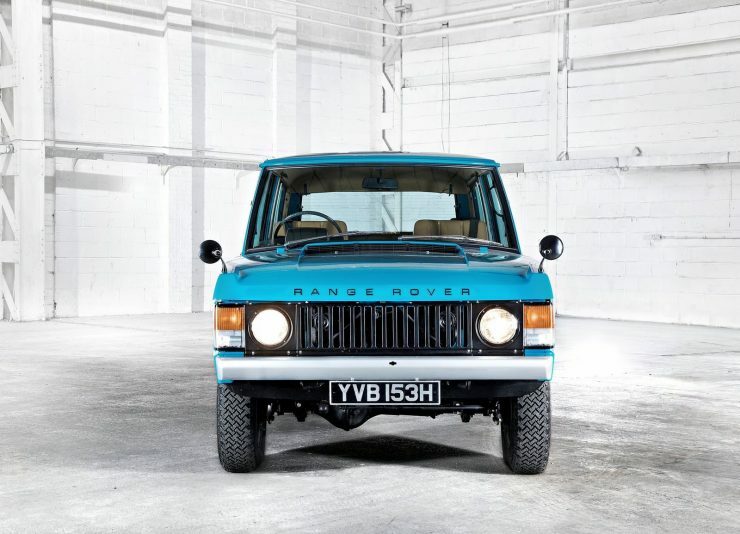 The Range Rover Classic is one of the nicest and most useful vintage automobiles out there, and many experts in the vintage and classic car world have pegged the two door Range Rover Classic are a serious investment vehicle – which has sent prices skyward. Properly set up and maintained it will take you just about any place you feel like going and it’ll take you places you haven’t heard about or thought of going yet. The earliest models are amongst the most rugged although the models fitted with the Borg Warner chain-driven transfer box are perhaps the best option. Buying any four wheel drive is a more difficult challenge because the vehicle is likely to have been places and done things that might damage it. The condition of the vehicle needs to be carefully assessed, and preferably assessed by someone who is a Range Rover specialist who knows these vehicles like the back of his/her hand. 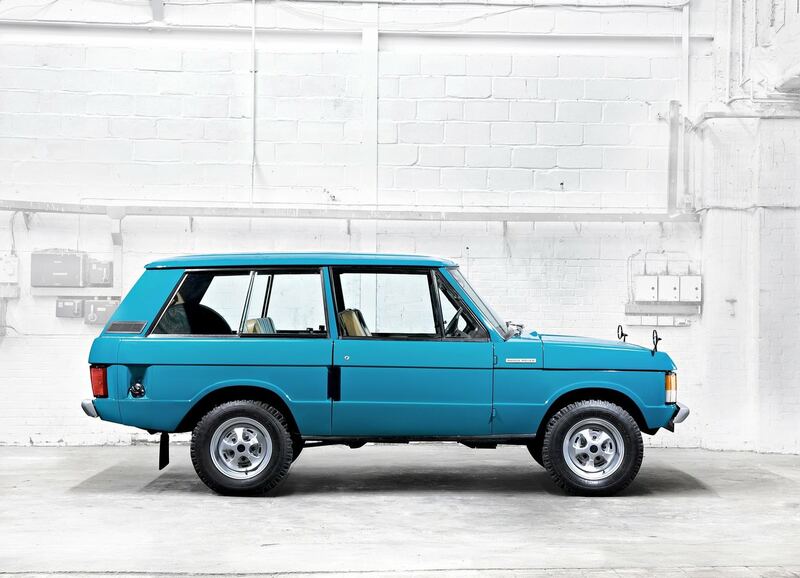 These early model Range Rovers that aren’t encumbered with computers and sophisticated electronics are an excellent choice especially if you are someone whose not afraid of getting your hands dirty fixing things yourself and you’ve made sure you’ve acquired the knowledge and skills to fix things competently. Editor’s Note: If you have tips, suggestions, or hard earned experience that you’d like to add to this buying guide please shoot us an email. We’re always looking to add to our guides, and your advice could be very helpful to other enthusiasts, allowing them to make a better decision.